As reported by TCi partner HarvestPlus, there has been a breakthrough in breeding for vitamin A in maize (corn) by a team of researchers from Purdue, Cornell and Michigan State. 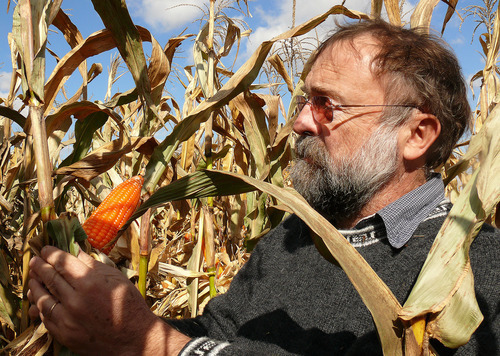 Purdue agronomy professor Torbert Rocheford (pictured), a longtime HarvestPlus collaborator, worked with the labs of Cornell plant breeder Michael Gore and genetiticist Edward Buckler, to identify a set of genes that can naturally increase the amounts of vitamin A that maize can provide. “This study gives us the genetic blueprint to quickly and cost-effectively convert white or yellow corn to orange corn that is rich in carotenoids – and we can do so using natural plant breeding methods, not transgenics,” said Rocheford. Vitamin A deficiency is a major public health problem, especially in Africa south of the Sahara. It causes blindness in 250,000 to 500,000 children every year, half of whom die within a year of losing their eyesight, according to the World Health Organization.